This “Little Piece of Paradise” is situated on the North Eastern coast of picturesque Zanzibar, overlooking the turquoise Indian Ocean. From your arrival at Zanzibar Airport, the resort is a meandering 45 minute journey through untouched scenery, passing classic African villages where little, in the way of life has changed for hundreds of years. Majestic coconut palms swaying in the breeze, white sandy beach, beautiful landscaped gardens and traditional style chalets all great you as you enter paradise. Designed as a traditional African roundhouse but featuring all the comforts needed, the rooms and suites are truly unmatched. Set in 6.5 hectares of colourful serene gardens, with white sandy beach slipping off into the turquoise waters of the Indian Ocean. 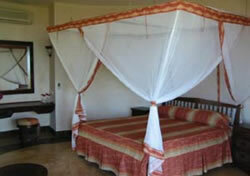 Each room is indeed an idyllic setting. All the rooms are sea facing, boasting large patio doors that open up to a private balcony, where you can sit and take in the sedate pace of African life. A peaceful sleep is guaranteed in a fully air-conditioned room with comfortable twin or king size beds draped with mosquito netting. The addition of satellite television and radio, direct dial telephone, mini-bar, hair dryer and a unique curved en-suite bathroom, with shower, toilet and bidet, complete the facilities. Ocean Paradise Resort features two restaurants that offer the finest food in Zanzibar, using only the best in local and imported produce. The Ocean Restaurant, sitting two floors up, has panoramic views over the resort and the Indian Ocean beyond. The Restaurant serves a delicious breakfast with an array of freshly baked breads, croissants and Danish pastries, cereals, fresh squeezed juices, local fruits, cold cuts and cheeses and of course, traditional cooked dishes. In the evening, the mood changes, with soft lighting, candles and an extensive themed buffet which changes daily. 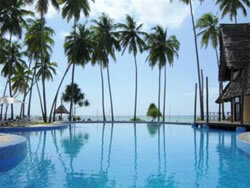 Down at the pool, the Jahazi Restaurant serves a variety of snacks and the best wood-fired pizzas in Zanzibar. 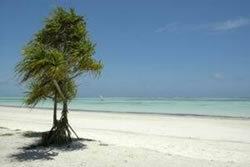 The menu offers an a la carte selection of international and authentic Zanzibar dishes. If you want to tie-the-knot on a white sandy beach with a backdrop of the Indian Ocean, Ocean Paradise can make our dream a reality. The resort handles all your arrangements from the service to the celebrations that follow. Honeymooners get that extra special Ocean Paradise treatment. There’s a bottle of bubbly awaiting you in the room and a romantic lobster dinner on the beach. Your honeymoon is guaranteed to be a relaxing affair, lazing by the pool soaking up the African sun or stretched out in a hammock under the coconut palms. Ocean Paradise boasts one of the largest and best equipped conference facilities in Zanzibar. The fully air-conditioned main conference room seats up to 180 persons and features a built in screen and projector. In addition, the trained technicians can assist with high quality audio-visual equipment, ensuring your presentations are delivered professionally and your conference runs smoothly.